Marylou Morano of Examiner.com mentions EFA Studio Member Artist Dannielle Tegeder's "Infrastructure" on view through June 30th, 2017 at the Montclair Art Museum. EFA Studio Member Artist Dannielle Tegeder's solo exhibition "Infrastructure" will be on view at Montclair Art Museum from June 5th, 2016 to June 30th, 2017. Paul Clemence writes a descriptive review of "Dannielle Tegeder: Painting in the Extended Field" in Metropolis Magazine, an exhibition currently on view at Hamilton's Wellin Museum, on view through July 28th, 2013. 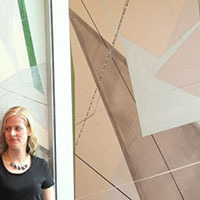 EFA Project Space artist Dannielle Tegeder is featured in the group exhibition "Simultaneity," exhibiting mixed media paintings at Grimshaw-Gudewicz Art Gallery in Fall River, MA from January 24 – February 22, 2013.